MT ALPHA JUNIOR TEAM REGISTRATION IS NOW CLOSED. Please note - We have a hard cap on the number of junior spots available. No Exceptions. We apologize for those who were unable to get in this year**, but we are unable to accommodate any more than our allotted number due to safety and the number of volunteer coaches available. The MT Alpha Junior program is SMALL and LIMITED in numbers. This is for both safety and so that we can provide our littles with as much one-on-one time as possible to really develop their MTB skills. Its a girls-only program (including coaches! ), which give the girls the confidence to push themselves and have fun doing it! This space creates a team dynamic among the girls; a very special thing. The girls will learn basic to advanced technical skills on their mountain bike (depending on ability level), gain knowledge about bike mechanics and riding in the mountains, and develop new friendships. Rides will last 1.5-2 hrs and will be focused on having fun. We have an extensive waitlist this year. Because of this waitlist, we would like to emphasize the importance of your little Alpha's attendance at every practice. If you do not think your little will be able to attend every practice, we ask that you reconsider joining MT Alpha. There are littles on the waitlist that have a demonstrated track record of good attendance. Missed practices (without objectively legitimate excuses) will mean that your little will not be on MT Alpha the following year and that they will not be able to attend our end of season party/trip. ** Waitlist - This year, we have a pretty extensive waitlist. While we wish we could accommodate EVERY girl who wants in, we are limited by the number of volunteer coaches available. If your Alpha is absolutely unable to attend (due to sickness, vacation, other legitimate excuse), she can miss 2 practices and still come on the retreat. But she is encouraged to come to an MTB Missoula Trail Day (click here). If she misses 2 practices, she MUST participate in a Trail Day or volunteer at another MTB Missoula event (contact us to arrange). Try our hardest and be positive. Weekly rides - every Thursday from 530-715/730 (June 21 until August 23. We will not be practicing on July 5th). Also, Moms should join our Race or Club team! ​​The MT Alpha Skills Clinic​ is open to Juniors and we encourage our Juniors and Little Alphas to sign up. It is a fun day of new instructors, new riders and new skills. Also, Mom can participate in the Clinic too! 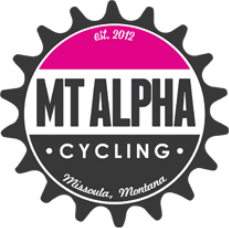 ​In addition to the weekly rides, MT Alpha will be offering a late summer cyclocross clinic... Stay tuned for this! With the Western Montana Trail Series, there will be many opportunities for the girls to test their new skills in a race setting. We encourge our girls to try racing but we know how intimidating it can be. We try to provide a comfortable and excited atmosphere so our girls feel inclined to try a race with no pressure but racing is always optional.